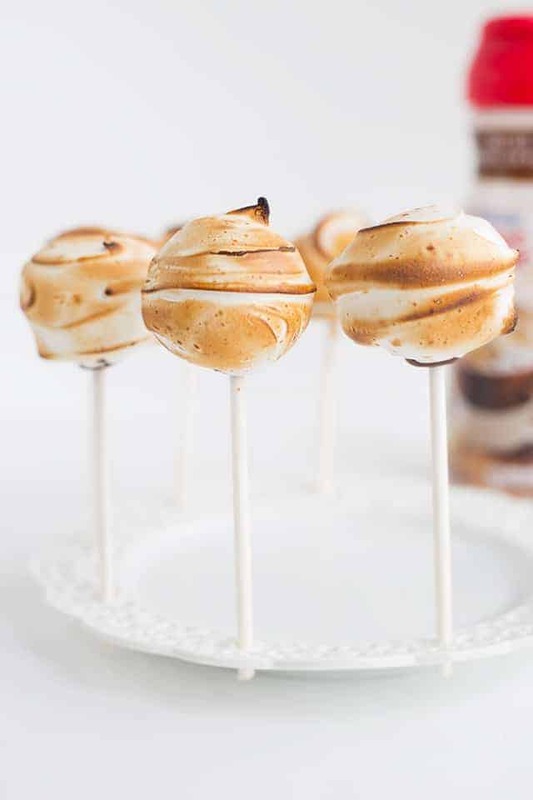 These toasted marshmallow mocha truffles are full of texture and layers. 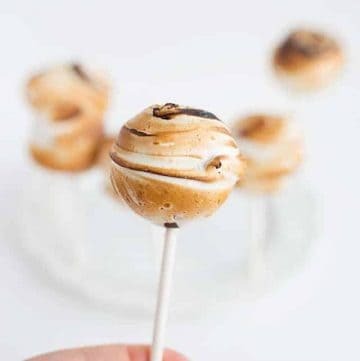 There’s a creamy, mocha ganache center wrapped in a chocolate shell and then dipped in a marshmallow filling that’s been toasted! To keep them easy to handle, I popped a stick in them. They’re the perfect little grab-n-go dessert. If you’ve been here for a bit, you know that I love adding ganache to most of my recipes. I’ve made a truffle bark, used it for drips on cakes, and even as a frosting for a cheesecake. It’s so easy to make but can take a little time to firm up. The best part about ganache is that you can flavor it with things like coffee creamers like I did here. I came across some new Coffee-mate® Dessert Creamers last weekend at Walmart and the toasted marshmallow mocha creamer flavor gave me instant inspiration. You can also use different baking chips to achieve different flavors of ganache. Here we’ll be using milk chocolate chips, but if you prefer semi-sweet chocolate chips, feel free to use those. I’m a lover of the milk chocolate chips even in my chocolate chip cookies, so that’s what I go with. After the ganache is all thick and creamy, pour it into a shallow dish to chill for 2 -4 hours (I prefer overnight). I would recommend a rectangle 7×5 dish or something similar in measurements. The goal is to let as much of the ganache be exposed to the air as possible. I used a deeper round dish and although it was possible to manage, it was pretty messy. The ganache wanted to run a bit more so I had to reform them later on. Okay, here comes the messy part. Scoop out the firm ganache and roll it between your hands. Place the truffles on a wax paper lined half-sheet pan and place them back in the fridge until they’re chilled and firm. Then you’ll be adding sticks dipped in candy melt into them and dipping them into the candy melt. After this, it’s all smooth sailing. The candy melt wraps the ganache in a neat and tidy package. Don’t be discouraged if your truffles look lumpy and sort of flat. 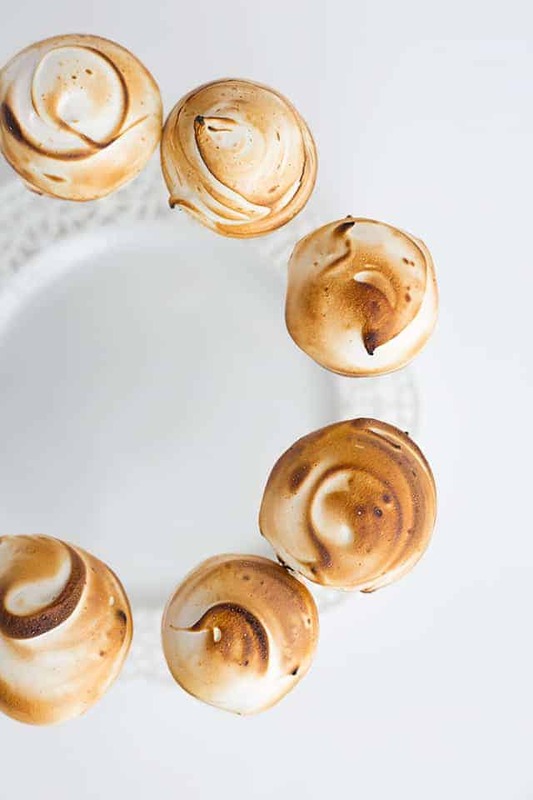 We’ll still be wrapping our homemade marshmallow cream around them and can cover up most of the imperfections and add a little extra marshmallow to the top for a rounder look if needed. When I dipped the truffles into the marshmallow cream, they were pretty smooth. I felt like they would be prettier with a little texture on the marshmallow so I ran a small spatula around the cream and added some drag marks and swirls. It’s totally up to you if you want texture too. 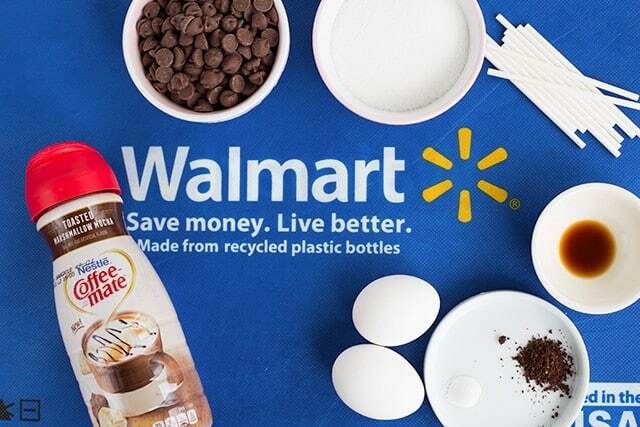 There are three new and seasonal dessert creamers available at Walmart. The coconut caramel latte creamer that would be delicious in a samoa inspired cake, cookies & cream which would be AMAZING in a popsicle, and of course the toasted marshmallow mocha creamer that is fabulous in these toasted marshmallow mocha truffles. Coffee-mate couldn’t have picked better flavors! I shared the coconut caramel latte creamer with my mom because she’s a coconut lover. 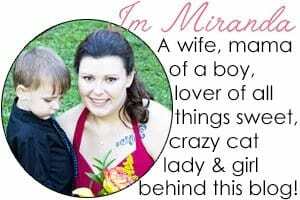 She said her after-dinner coffee tasted just like a dessert. Who doesn’t want their coffee to taste like a dessert? I made my son a cup of hot cocoa and used some of the toasted marshmallow mocha creamer. It was so good, I made myself a cup too. It’s so fun to be able to experiment with fun flavored coffee creamers in my family’s favorite drinks and desserts! Is your ganache still too thin to roll into balls? Place it back into the fridge to firm up. If it’s still too thin after being in the fridge overnight, heat it back up and add an additional 1/4 cup of chocolate chips to the ganache. Place it back into the shallow dish and chill again. Can you cool the ganache down faster by placing it in the freezer? You can, but after it begins to thicken I would move it to the fridge. It could freeze solid and you won’t be able to scoop it. Don’t place the truffles that have been formed into balls into the freezer. When you dip them in the candy melts, it will crack your candy melt coating. 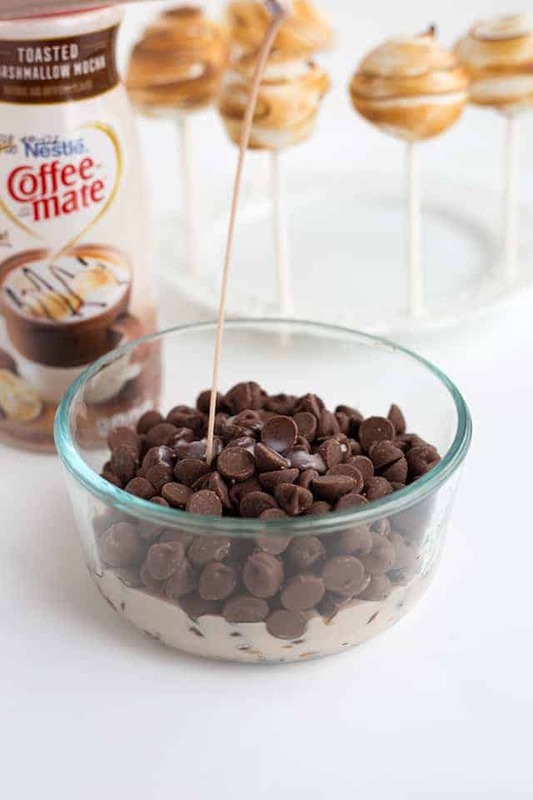 Where can I get the Coffee-mate Dessert Creamer in the Toasted Marshmallow Mocha flavor? It can be found in the cooler section of your local Walmart. Mine is located near the milk and eggs. And be sure not to miss the other two available flavors – Coconut Caramel Latte and Cookies & Cream. With these being a seasonal product though, I wouldn’t waste any time getting to your local Walmart! 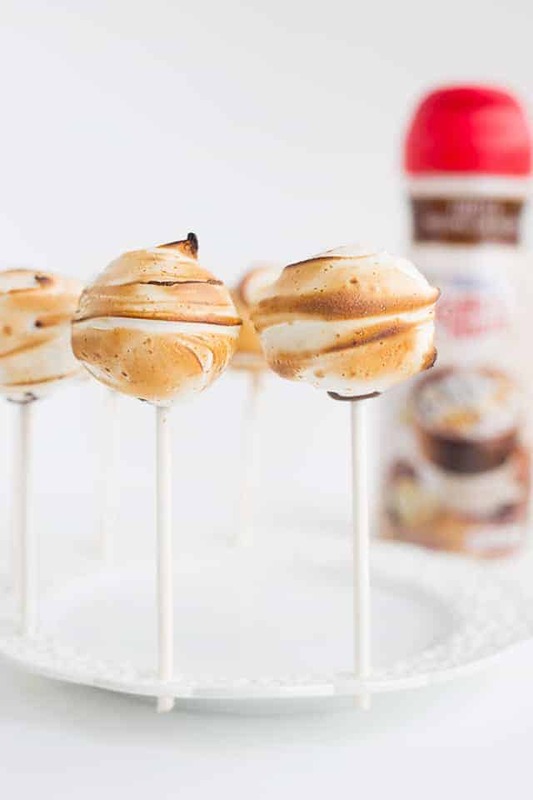 These toasted marshmallow mocha truffles are full of texture and layers. 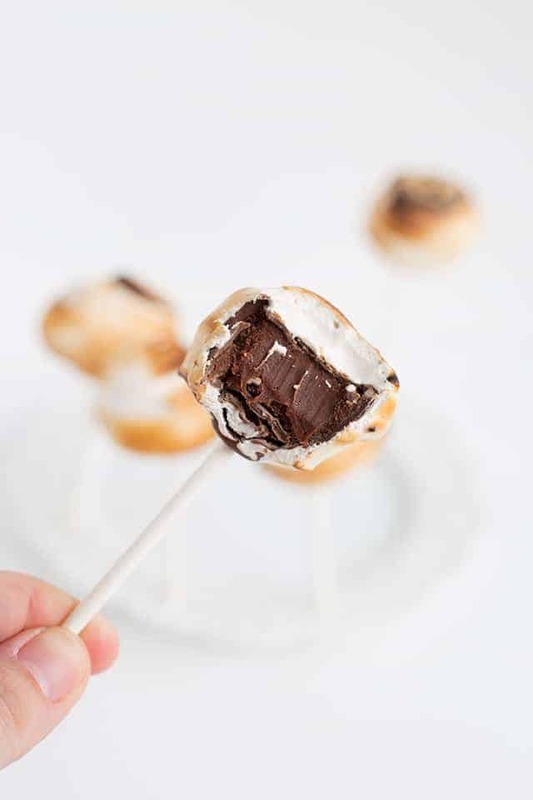 There's a creamy, mocha ganache center wrapped in a chocolate shell and then dipped in a marshmallow filling that's been toasted! To keep them easy to handle, I popped a stick in them. They're the perfect little grab-n-go dessert. In a microwave-safe bowl, add in the chocolate chips, coffee, and coffee creamer. Microwave for 30 seconds and stir. Repeat microwaving and stirring until the ganache is thick and creamy. Place into a shallow 7x5 rectangle dish or something similar. The more ganache being exposed to the air, the better. Place in the fridge for the minimum of 2 - 4 hours. I leave mine overnight to firm up. Using a 1 tablespoon cookie scoop, scoop out the firm ganache. Roll into balls and place on a wax paper/parchment paper lined half-sheet pan. Place back into the fridge to chill until it's firm. I left mine for about an hour. Add the candy melts in a microwave-safe bowl (I used a mug). Microwave for 30 seconds and stir. Repeat microwaving for 30 seconds and stirring until the candy melts are all melted and smooth. Reform the chilled balls if needed. I used an offset spatula to remove my truffles from the wax paper. Dip the lollipop stick into the candy melt and place into the center of each chilled ball. Let the candy melts firm up. It should only take about 5 minutes. Once the candy melt is hard, grab the truffles up by the ganache ball instead of the stick. They can be a little sticky and you don't want to risk breaking the seal on the stick. Make sure the melted candy melts aren't piping hot. If the candy melts are too hot, it will start to melt the ganache balls. Grab the truffle by the stick, and roll it in the candy melts. Be sure to cover the seal of the stick with more candy melt. Place back onto a clean spot on the wax paper to dry. Repeat with all of the truffles and set aside. You'll want to find a box and add small slots into it. This will be to hold your finished truffles. Add the egg whites and sugar into a heat-safe bowl. I used my stand mixer bowl. Place it on top of a saucepan that's smaller than the bowl with a very small amount of water the bottom of it. The goal is to just have the bowl to set on top of the saucepan and not inside it. Don't let the bottom of the bowl touch the water otherwise the egg whites will cook. Bring the water up to a simmer and whisk the egg whites and sugar constantly until the sugar is melted. I use a clean finger to dip into the mixture and to feel if it's still gritty or not. In a small dish, add together the vanilla extract and coffee. Stir until the coffee is dissolved. Pour into the meringue. Beat until incorporated. Dip each truffle into the meringue. Roll it around until the sides and top are coated. Using a culinary torch, toast it. Place the stick into the box you prepped earlier to keep the marshmallow from sticking to sticks. Repeat with the truffles. Ooohhhh my goodness! I have had smores on my brain lately. Wish I had some of these in hand right now, not to mention that Toasted Marshmallow Mocha coffee creamer! Pinning this recipe for later.